Deathsticks | Comics I Don't Understand - This site is now being updated daily at http://www.comicsidontunderstand.com. Please change your bookmark if necessary, and notify any web site with a link to the old address. Other than being reminiscent of Dead Like Me, what’s the actual joke here? Getting to know future customers? Those things will kill you, you know. 1: Death is “waiting outside the door” for somebody (presumably for me – everyone seems to like coming up with scenarious where I get hit by a bus) and having a smoke to kill time while he waits. 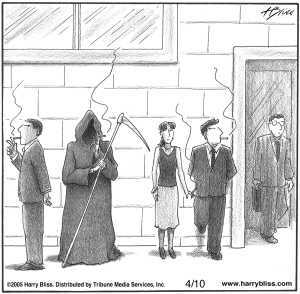 2: This is actually REALLY GOOD NEWS to see death smoking… I mean, people who go out for a smoke ARE NOT WORKING for those 20 minutes every hour, so his new habit should result in a 33% decrease in the death rate. I’m guesing it’s all about taking a ciggie break. Lots of folks take a smoking break throughout the work day. Even Death needs to take a break once in a while. ‘Death takes a smoke break’ instead of ‘Death takes a holiday’?